Protecting the Outstanding Universal Value (OUV) of the Great Barrier Reef World Heritage Area in a time of massive mining expansion in Queensland is critically important. Cumulative impacts have never been assessed and this oversight has led to the recent assessment by GBRMPA (in their new Biodiversity Conservation Strategy) that humpback whales, inshore dolphins, sharks, rays, sawfish, sea snakes, threadfin salmon, offshore seabirds and seagrass are highly vulnerable. These vulnerability assessments were undertaken on habitats, species and groups of species identified as being potentially ‘at-risk’ and are meant to inform management priorities. Despite a raft of specific programs, legislation and investment aimed at halting its decline, the ecological condition of the Great Barrier Reef has continued to deteriorate due to a range of unresolved issues and new threats. 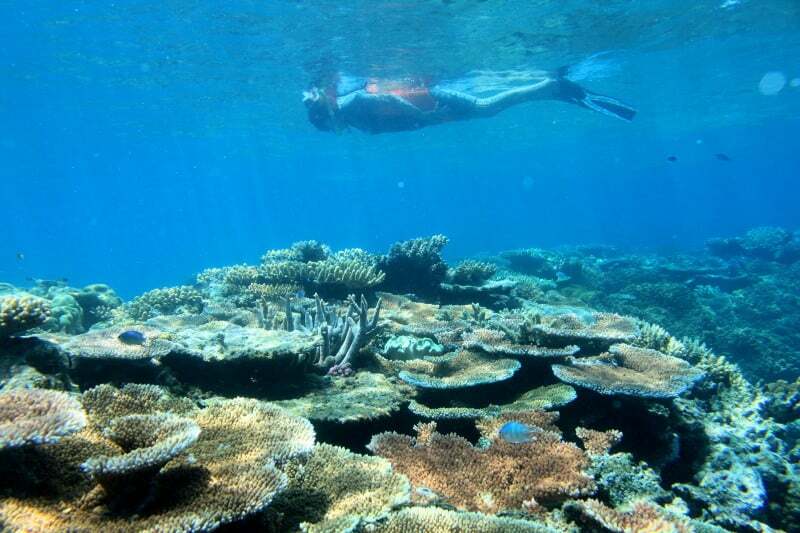 The GBR Marine Park Authority’s Reef Outlook Report 2009 states that the overall outlook for the GBR is poor even with the recent initiatives to improve resilience and that catastrophic damage to the Reef may not be averted. Along with the adverse impacts caused by polluted farm run-off, outdated fishing practices, and coastal development, the GBR is facing an onslaught of additional pressures from a multitude of new development projects that are currently being considered within and adjacent to the World Heritage Area. Proposed developments are mostly connected to the massive expansion of the coal and gas industry which include massive port facilities, mega dams, urban development, open cut coal mines, railways and pipelines – all of which are likely to cause significant direct and indirect impacts to the GBR should they be approved. Locally the issues which we face as a result of this coal and gas expansion are many. The GBR supports a $5.1 billion tourism industry which employs 54,000 people and supports numerous communities along the Queensland coast. The GBR creates more jobs than the entire coal industry, which makes up just 1-2% of the entire workforce. In a workforce of over 11 million, only 217,100 of these jobs are in the mining sector. More people work at McDonalds than in the mining sector. Coal expansion along the coast of Queensland undermines trade-exposed industries such as tourism and manufacturing. Existing expansion has seen a surge from 4% of GDP in 2004 to around 9% today, leading to a reduction in the price of exports and increasing international competition. Only around 10 per cent of production growth from new coal mines and expansions is expected to be consumed in Australia. The tourism industry and international education industry has also been heavily affected by the high Australian dollar (a result of the mining boom) and the recent international reports about the state of the GBR. Although the main extent of the coal and gas boom is in Central Queensland, many of you may also be aware of the huge exploration interest for coal and gas in Cape York, particularly around the Rinyirru (Lakefield) National Park north of Cooktown. In addition, the Wongai Coal Mine project to the east of Rinyirru National Park has already moved to the assessment process phase. In fact since the state election the project has been nominated as a ‘Project of State Significance’ which means all of the federal and state government assessments are handled through the Qld Coordinator General – this has historically had the effect of fast-tracking development and making it very unlikely to be knocked back. We have also heard recent reports of accommodation being built and roads created prior to any approvals for the mine. At its meeting in July 2011, the UNESCO World Heritage Committee expressed its extreme concern about the potential impacts to the recognized values and integrity of the GBR from increased development within and adjacent to the World Heritage Area. UNESCO’s concern highlights the problems of assessing new extractive industry infrastructure on a case-by-case basis. The high rate of approvals (approx 70%) for mining infrastructure, port facilities, dredging, transport, pipelines and water related facilities poses serious concerns for the long-term conservation of the Great Barrier Reef and the Outstanding Universal Value (OUV) the area is listed for. Other developments such as tourism, agriculture and aquaculture developments have also historically been assessed in isolation. UNESCO says an ‘‘in danger’’ status could be applied to the World Heritage Area if the federal government does not give the World Heritage Committee evidence of substantial progress before February 1st 2013. 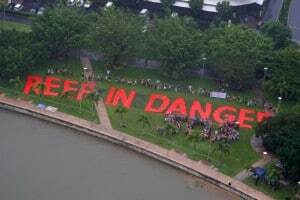 As you would no doubt be aware in March 2012 this year the World Heritage Committee sent an investigative delegation to inspect the conservation and management of the GBR World Heritage Area and in Cairns community voiced its concern, with more than 400 people braving the rain on the Esplanade to show their commitment to “Save the Reef”. CAFNEC with a number of other groups also met with the UN delegation while they were in Cairns. In response to UNESCO, the Australian and Queensland Governments have agreed to conduct a ‘Strategic Assessment’ of the World Heritage Area under the Environmental Protection and Biodiversity Conservation Act 1999. The stated purpose of the Strategic Assessment is to gain a comprehensive understanding of the extent and scale of impacts on the Reef’s values that may occur from existing and new development projects within and adjacent to the World Heritage Area. CAFNEC along with other environment groups across Queensland, have been advocating for this Strategic Assessment to consider all direct, indirect and cumulative impacts of the GBRWHA and all of the impacts on it. We would also like to see a moratorium on all new development until this strategic assessment is complete. The Draft Terms of Reference for the assessment did not take these issues into account and excluded projects that were already submitted for assessment prior to the Assessment process starting, which includes many of the large coal and gas projects including port and rail lines along the Great Barrier Reef. The Final Terms of Reference for the assessment were released in late August 2012 and a response from the conservation sector is currently being prepared. The assessment has been split into two segments: amarine component to be undertaken by the Great Barrier Reef Marine Park Authority; and a coastal component to be undertaken by the State Government. In both cases the assessments are focused on the policy tools the Queensland Coastal planning and management framework, and the GBRMPA management framework, rather than current and potential development actions. Information from senior bureaucrats about these two parts of the Assessment indicate that GBRMPA is focused on reviewing their management arrangements ground-truthed against all the data that exists on the state of the GBR. GBRMPA will then effectively seek to have the GBR Management Plan approved under the EPBC Act. A GBRMPA stakeholder meeting was held in late August which representatives from CAFNEC attended . To date there has been no community consultation that we are aware with by the State government for the coastal part of the assessment. The State government coastal component of the Assessment appears to be solely focused on the planning framework itself rather than the impacts of current and planned developments and activities on Matters of National Environmental Significance (MNES) such as the Great Barrier Reef World Heritage Area, listed species and other matters. The State Government sees the purpose of the assessment is to have ‘classes of action’ effectively pre-approved under the EPBC Act, effectively removing the current federal oversight we now have. In addition, the Qld planning framework continues to change and the State plans to include in their assessment report a draft Ports Strategy (yet to be written), a new Coastal State Planning Policy (to replace the Coastal Plan), a revised Biodiversity Offsets Policy and their program of Regional Plans. In addition the whole basis of Queensland planning framework is based on ‘avoiding, mitigating or offsetting’ impacts (and not always in that order! ), rather than a planning system that can ‘prevent’ development that may have an adverse impact. Queensland also does not have any reference to MNES in the planning framework. CAFNEC would like to see that the Strategic Assessment process ensures an overall gain in the integrity of the GBR WHA through: Identifying planned and potential development likely to impact on the Outstanding Universal Values, and working to prepare a long-term plan for sustainable development that will protect the Outstanding Universal Value of the GBR WHA. – Write to Minister Burke and (QLD Environment Minister) Minister Andrew Powell. 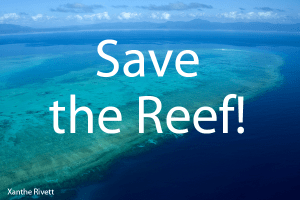 – CAFNEC and other local groups would like to start a Reef in Danger Action Group. Please contact us for more details of how to get involved.